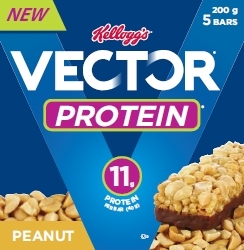 I recently tried Kellogg's new Vector Protein bars. These new snack bars are boasting 11 grams of protein compared to the Kellogg's Apple Nutri-Grain bars I've had to abandon for the higher sugar and lower protein content. I wasn't a fan of Vector cereal but the Vector snack bars are sweet enough to satisfy my cravings for something other than fruit. I can't bring them to work because it is a NUT AWARE facility, but still a great alternative once in a while when I'm trying to avoid snacking on a chocolate bar at home.